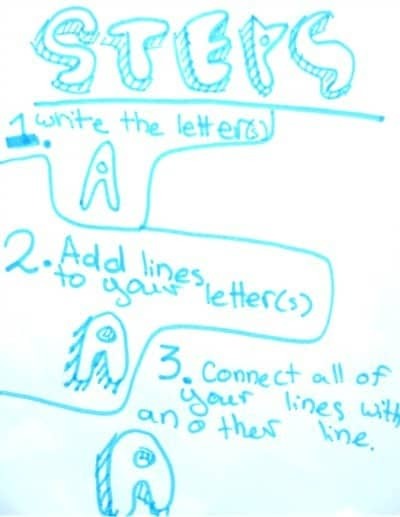 Do your kids know how to draw cool letters? I love exposing kids to design concepts. They’re aware of design, they like cool things, they are attracted to good design. Yet somehow, I think most kids probably don’t talk about design concepts all that much. Maybe I’m wrong. When we’re all sleeping, perhaps our kids hop on he computer and all converge in a secret chatroom about Mid-Century modern furniture. Yes. Anyway, I think one of the easiest ways to expose kids to design is through typography. They are already practicing their writing every day, and many of them will doodle their names all over the place, in various ways. They’re just dying to learn how to draw cool letters, right? I remember my mom’s handwriting, and my mother-in-law’s looks very similar. I’m not sure what style of writing they learned, but I do know that I figured out as a kid that words are more fun to read if they look good. I think it can be easy to give kids an appreciation for handwriting and typography. It leads to an appreciation for graphic design- do you remember our peanut butter label design project? In my kid-typograhy research, I came across some awesome looking books I thought I’d share with you. The only one we have is the Klutz lettering book, and Fen adored it- which means now it’s buried, and I need to go dig it out from somewhere so she can rediscover it. The Doodle Diary book goes a step further by giving a lot of playful prompts to combine writing with drawing in the form of a creative journal. 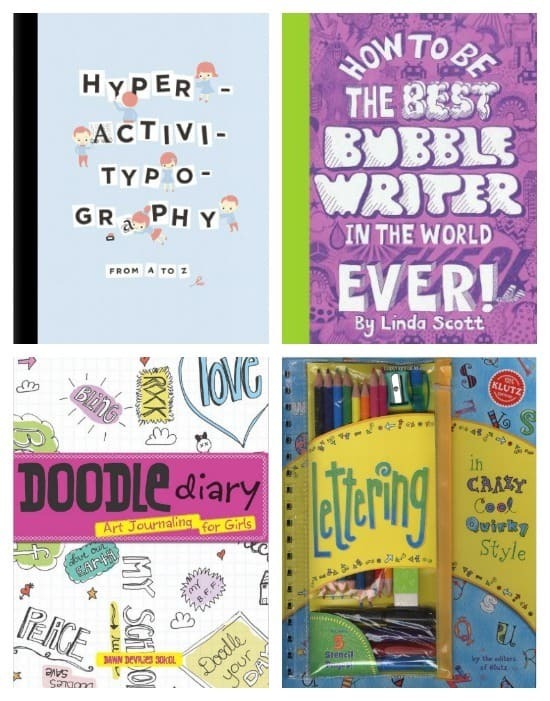 Clockwise from top left: Hyperactivitypography by Studio3, How To Be The Best Bubble Writer In The World Ever, Lettering In Crazy Cool Quirky Style, Doodle Diary. 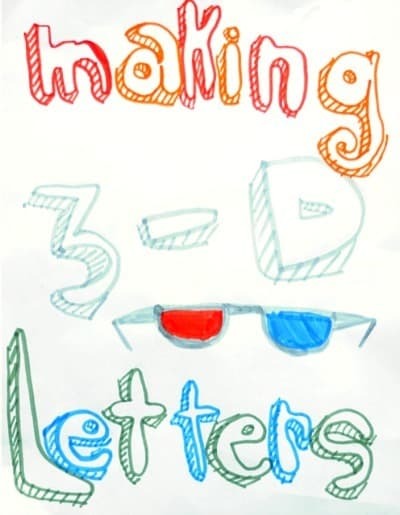 Are your kids into cool letter designs? Post some of their word art on my Facebook page if you get a chance…. and don’t forget to keep a few of these gems for when they’re older; they’ll love looking back at their creations. P.S. Want to learn how to write your name in graffiti? My kids got into different ways of writing at a certain point, I think around 3rd grade, when learning to write was old hat and they were experimenting with different ways to print and write letters. They also learn cursive in school, so that helped a ton. My son went through a calligraphy phase, when his after-school club teacher provided each kid with a calligraphy marker and a guide. For a while everything he wrote was decorated with old-world styling. My daughter sticks to bubble- and block letters and coming up with her own ways to make certain letters (a loop at the end of her “y”, a starburst and a flourish at the end of her name). That’s a good point- writing probably loses its excitement around 3rd grade, so kids naturally want to make it more fun by experimenting with it. That is a really good point that words are more fun to read when they look good. Love Fen’s tutorial and I will have to look through my daughter’s notebooks. She has been busy lately with gel pens. Oh, fun! I’d love to see some of the stuff she’s done. What kind of gel pens do you get? I keep spying them at stores and want to buy some, but just haven’t. Thanks for this creative article. My nephew and nice are fond of my daddy’s handwriting and truly dad’s writing is always a fun as he can make letters more attractive than ordinary font. Moreover I think it would be more fun for kids if letters come in a new shapes and colors. My daughter will love this! 🙂 Thanks for sharing! My kids love to write in bubble letters and the graffitti version is very cool! Going to show that to my kids when they get home from school! Did you show them and then all run out to tag some buildings?